Tried other tourist-clogged Rome neighborhoods? Ready for something a bit different? Testaccio is a Rome Neighborhood anchored by the old stockyards and a hill made of Roman amphora fragments discarded from ships on the nearby Tiber. Foodies like Testaccio because of the traditions surrounding the Roman cuisine of the stockyard workers. This means offal will be served in local restaurants, as workers were given these pieces at the end of the day--and they (or most likely their wives and mothers) learned to cook them into tasty meals. But it's not all innards in Testaccio. The foodie shrine called Gastronomia Volpetti is here, and the covered market is as lively as it can get, even without the throngs of tourists that flock to better-known markets in Rome. La Città dell'Altra Economia will educate you in fair trade practices and ply you with international organic food at the same time. When I first came upon Monte Testaccio, Testaccio's potsherd hill, Rome's car repairmen had dug out caves in the hill for their repair shops. Today those caves have been transformed into sometimes lavish night clubs and wine bars. It's where Rome's beautiful people go to exercise their dolce vita. Testaccio is located south of the Aventine Hill right along the Tiber. It makes a beautiful walk from Trastevere or the Campo de' Fiori on a sunny day, as you can see from the picture, taken in December. Join us for a tour of Testaccio, including tips on what to see, where to have coffee and a pastry, where to eat and where to have a night out in this up and coming working class neighborhood. Here is a view of the Amphora hill known as Monte Testaccio. The hill was once named Il Monte de' Cocci, or the mountain of cocci, referring to amphora sherds, then later was combined with the Latin “testae,” referring to a potsherd that was often inscribed and used for voting, to become Testaccio. Over the years facades have been added to the carved out sections of Monte Testaccio to transform it into the clubbing center you see in the picture. If all the walking makes you a little thirsty (or hungry) and you want to have a coffee or pastry, Linari is a place to rub elbows with the kind folks in the neighborhood. Gastronomia Volpetti, on Via Marmorata 47 is the place where you can buy everything from pizza and sandwiches to some of Italy's best cheese and meats. It's an amazing and crowded place--but there's plenty of high-quality help on hand to guide you. Buying provisions for a picnic in a park is the way to go if you're trying to save money--but you won't find anything dirt cheap in Volpetti, it's the real deal. The Testaccio covered market in Piazza Testaccio is another place to go to find fresh vegetables, meat, and cheese. It's not a tourist market, but it's an honest, working-class market with a selection of edibles that will amaze you if you're used to the limited selection of things in an American market. Around the periphery of the Testaccio market, you'll find stands selling clothes and shoes and mechanical things. If you're really into shoes, the Testaccio market is the place to find beautiful bargains, shoe lovers have told me. The Testaccio stockyards, representing the southern boundary of Testaccio and wedged between the Tiber and Monte Testaccio have given way to MACRO al Mattatoio, a vaunted contemporary art exhibition space which is the cornerstone of the arts center now occupying the old stockyard buildings. Exhibitions start late in the afternoon, but a good time to walk around is in the morning. They haven't really dismantled all the mechanisms upon which carcasses were moved around the place, so you can get a pretty good idea of what went on here--without the smell. La Città dell'Altra Economia is found in Largo Dino Frisullo. It's a very interesting complex devoted to fair priced products and organic foods, offering exhibitions, a food market, "bio" bar, restaurant, education facilities, and a renewable energy center. Lots of festivals use the area in front of the complex, which was the cow field, or Campo Boario when the stockyards were in use. 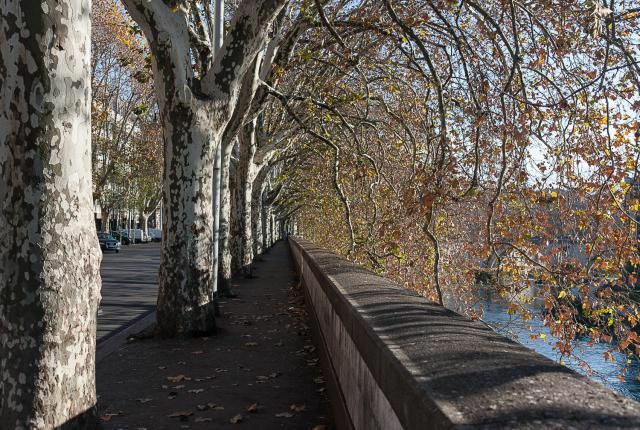 It has entrances from the Lungotevere di Testaccio (the street that runs along the river) and from the Largo Dino Frisullo on the via Monte Testaccio. For what is considered by many to be the best pizza in Rome, head over to Remo, Piazza Santa Maria Liberatrice 44 in Testaccio. Volpetti Piu, an extension of the Gastronomia Volpetti, serves cafeteria style meals that are both good and inexpensive on Via Alessandro Volta 8-10. As is tradition, lunch offers the largest variety. Come on Fridays for fish. For those times when you want the traditional served right, I highly recommend Checchino dal 1887 on via di Monte Testaccio, 30 in Testaccio between Monte Testaccio and the stockyards. A bit formal and not cheap, but worth it. Agustarello on Via Giovanni Branca, 100 is another of those traditional Roman places worth a look. Try gnocchi con pajata, with baby veal intestines. As you head back toward central Rome on foot following the pleasant Lungotevere, you can choose to enter what is known as the Ghetto near the Portico d'Ottavia, just across from the Isola Tiburtina. Roman Jews were locked into this corner of Rome at night for more than 300 years starting in 1555, but today it is a thriving neighborhood full of bakeries, restaurants, and shops. Here foodies will find a whole different Roman cuisine. You can visit the Synagogue and Jewish Museum; walking tours are conducted once a day (never on Saturdays). The Synagogue is located on the Lungotevere de' Cenci. Next, you can see some of the food specialties of the Ghetto. Ok, so I will repeat what everyone will tell you, "You must try the Carciofi alla Giudia." Those would be the famous fried artichokes as prepared best in the Ghetto section of Rome. The picture shows you some of the food specialties of this corner of Rome. Quite different than the food of Testaccio, but just a 15 minute walk away. This includes our tour of Testaccio and the Ghetto of Rome. Hope you've had fun. Plan on visiting soon.